Our mobile homes contain a parents bedroom, childrens bedroom with three beds, a fully equipped kitchen, and a separate toilet and a shower in the bathroom. 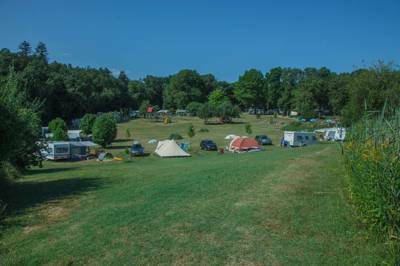 A camping pitch with acces to all on-site facilities. You may come to the Dordogne full of good intentions – the caves you wanted to visit, the vineyard tours you had planned, the museums you fancied nosing around in – but in the thinly spread little village of Lestaubière most plans begin to unravel. Camping here is like stepping into a time vortex where somehow, no matter how hard you try, the outing you had organised is lost to a day of swimming, sunning and simply hanging around the campsite. Not that it’s a bad thing. Finding a campsite as relaxed and social as this is exactly what most families are after. Just make sure you book a stay long enough to take it all in. There’s plenty here to do! 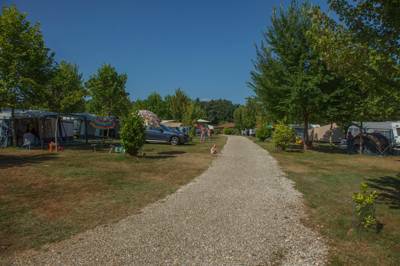 The campsite itself is probably larger than the rest of the village put together – and, with 100 pitches centred around a swimming lake, that’s testament more to the tiny size of the village than the enormity of the campsite. In fact, it has a deceptively intimate feel, with the camping divided into two separate fields and the terrain broken up by trees and shrubs. When you enter, you can turn right, heading off to one camping area, or left, leading you around to the second, along with the central reception building where there’s an indoor games room and library for rain days. Rainy days are rare though (that’s why you came to sunny France, remember?) so it’s not the library that’s soaking up your time. Instead it’s the inviting looking swimming pool, circled by a deck chair dotted terrace and overlooked by a small café-bar where you can enjoy a drink as you supervise the children. For something a little wilder, the oval-shaped swimming lake is the real treat. Long reeds cover much of the edge, while a short stretch of sandy beach is the perfect entry point from which you can swim out to a wooden platform, ideal for jumping in. There’s also a beach volleyball court, a boules pitch and an excellent little playground for children. By the time you’ve done all that and dried off it’s easy to see how the day has disappeared. If you do manage to make it further than the campsite gates, the rewards of the surroundings are still well worth it. 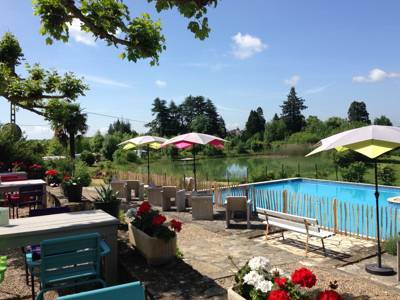 Empty country roads seem designed for summer cycling, while a 25-minute drive south to Bergerac presents you with one of the most idyllic little towns in the region, plus the opportunity to hop in a canoe and paddle down the river. There’s life beyond the campsite vortex and it’s very pleasant indeed! 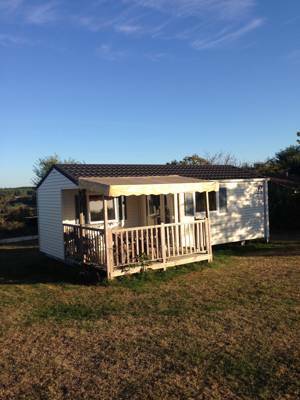 For latest availability and best prices for Camping Lestaubiere, please use the Date Search above. 100 camping pitches almost all with electricity. There are 3 sanitary blocks equipped with modern toilet and shower facilities, baby baths, dishwashing bowls, disabled access, washing machines and dryers. There are also 2 chemical disposal points. Wi-Fi, a library with books and magazines to borrow and a games room with billiards, table football and board games are also free to use and there's a beach volleyball area, table tennis and two boules courts. There's a swimming pool and separate toddler's pool, plus the swimming lake with a beach area and wooden diving platform. Fishing is permitted in the lake. There's a tennis court within walking distance – 500m from the campsite. It's a 25 minute drive south to historic Bergerac, on the banks of the Dordogne river. The old town centre – 'vieille ville' – has a variety of boutique shops in half-timbered buildings. Visit the 12th-century Maison de Vins de Bergerac (05 53 63 57 55), where there's an exhibition showing the history of Bergerac wines and its 13 appellations, along with regular musical concerts throughout the summer. At the top of the main square – Place Pelissiere – the lovely Saint Jacques Church is also worth popping into. Much of it was destroyed in the Wars of Religion but its attractive bell-tower and balcony remain. Bergerac is also a great place to hire canoes to paddle the river (05 53 22 95 88). You can rent them here and get picked up further downstream, so all the hard work is done for you. There is a bar with a terrace on the campsite where you can order snack-type food, hot and cold drinks, as well as beer and wine. Several times a week they also serve a variety of menus – varying by the season – and freshly baked pizzas can be ordered daily. Fresh bread can also be ordered every day. You can also walk the 15 minutes into the village where there is a small shop and bakery. Camping pitch €6.75–€12.75; adults (older than 7yrs) €5.25–€8; children (younger than 7yrs) €3.25–€5,00; electricity €4.50–€5.50; pets €1.50–€3.50. Low season special offer for Cool Camping customers: €17 per night for a pitch, 2 adults and electricity. If you come from direction Bergerac heading for Perigueux (RN21), take the N6021 towards Pont St. Mamet, continue straight on passing the little village. After passing the village the campsite is 500 meters along on the right. If you come from direction Perigueux heading for Bergerac (RN21), take the N6021 towards Pont St. Mamet North, after 800 meters (before entering the village) the campsite is on the left hand side.